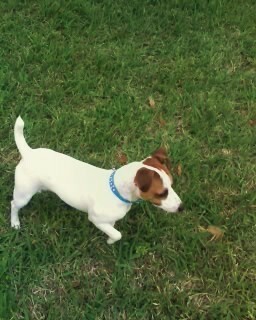 Our JRT is 17 months old and I have always wanted one. When I went on the internet to find one, he was the first dog I saw and I knew right then and there that he was the dog for me. When my wife and I were bringing our puppy home from the airport, he was sitting in her lap and we locked eyes and he has been my buddy ever since! ChubChub loves to ride in our truck. He knows when I am about to leave. He will sit at my feet and give me what i call the "soul stare". His eyes pierce my soul and I have to take him with me. He will not sleep anywhere but by my side and he is a bed hog!!! He has to sleep under the covers. I love my dog as much as I love my wife and kids and I can't imagine living my life without him or my family.